The Bugatti Chiron Sport "110 ans Bugatti" has been unveiled with a subtle two-tone exterior paint job. Buyers have been limited to the virtually unchanged "42", which marked the car's record breaking performance, or the far more extreme Divo, which was an even greater departure from the standard auto than expected. 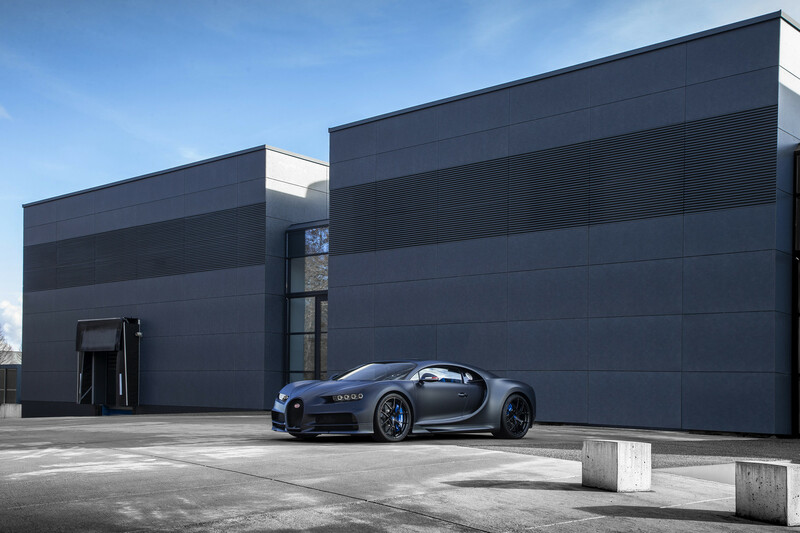 Other areas of the Chiron 110 Ans Bugatti are finished in exposed carbon fiber, finished in Steel Blue Carbon. Composite is used for manufacturing outer panels, front and aerodynamic elements. The rest is painted in matt "Steel Blue" said to be reminiscent of Bugatti's historic models, and paired with matt "Nocturne" black wheels and French Racing Blue brake calipers. Carbon fibre is also be found on the nacelle, steering wheel, steering column and seat trims. Inserts in doors and seats are made from Alcantara, and bluish skin tint which is called Bright French Racing Blue. Instead of some clear nods to the old Type 10, Bugatti has turned the Chiron into a celebration of France, where Italian-born Ettore spent much of his life. It was "light, small and nimble with an adequate power output". The engine compartment cover of the "110 ans Bugatti" is resplendent in Steel Blue and Steel Blue Carbon. That's enough to get the machine from zero to 100 km/h in under 2.4 seconds; up to 200 km/h in 6.1 seconds; and 300 in 13.1 seconds. The famed Bugatti line, the brand's graphic DNA, also adorns this exclusive model.